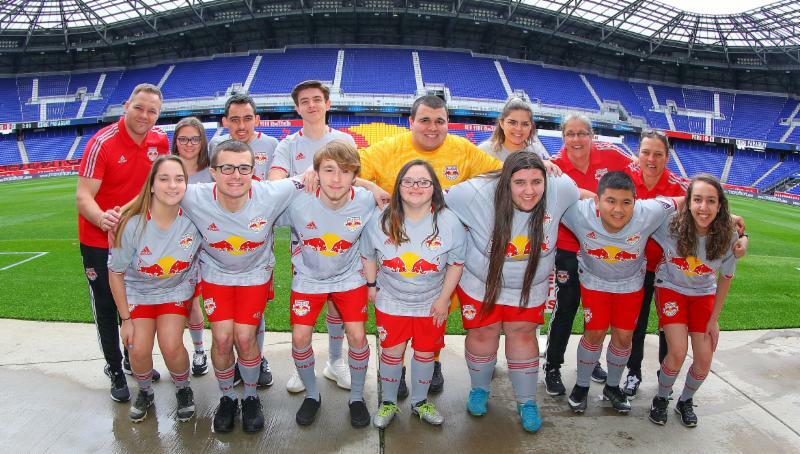 Tweleve athletes out of the Special Olympics in NJ are now on the Red Bulls Unified Team, all this is part of the wonderful project in MLS Works Unified Exchange Program. The presenting partner in this for the team is Prudential Financial. This year they will feature 4 fixtures, 3 as double headers with the first team on May 4, July 14 & Sept. 22 at RBA. They make the trip to wonderful Childrens Mercy Park for Sporting KC. Sporting Dir. Denis Hamlett and the team welcomed them to RBA for a tour, their contract signings and of course their respective kits. Denis stated, "We are very pleased to have these 12 players represent the club. We are excitied to have them along with us for the road trip to Kansas City." For their part, Prudential Financial VP & head of Brand Marketing, Advertising & Global Insights, Niharika Shah had this to say, " A source of joy for many of us is playing and experiencing sports. This program is so special and is a wonderful expression of inclusion and inspiration." This is the 6th year of the Red Bulls United team, as they are a part of several other MLS teams to field such teams with Special Olympics. Photo source New York Red Bulls.